There are any number of trinkets, arrangements, and special dinners to give your mom for Mother's Day. Give her something to let her know how much she means to you. My mom recently went through open-heart surgery and is now recuperating. For several days prior to and during the surgery, her hospital stay and now recuperation I was called on to put my life on hold and be there for her. I want her to know that it is an honor and privilege to do these things for her just as she has done so much for her children and grandchildren over the years. Ask your Senator to take up and pass HB 190 to ensure annual inspections of abortion facilities. Click here to get your Senator's phone number. While you are talking to your Senator also ask them to pass Simon's Law (SB 466 & 422) to ensure that a DNR order is not placed in a minor child's file without the parent's knowledge. SB 466 & 422 - Simon's Law ensures that do-not-resuscitate order is not placed in a minor child's medical file without the parent's knowledge. Update on HB 5 Alternative to Abortion Funding and HB 7 Pro-life language on Economic Development Budget Bills: Missouri Gov. Nixon signs $26 billion spending plan -- which includes $2,158,561 appropriated by the legislature for Alternatives to Abortion. 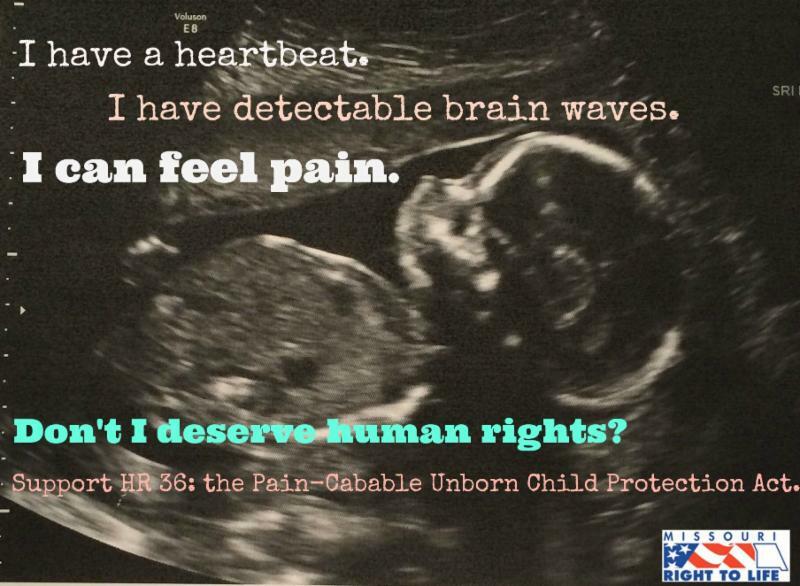 U.S. House to vote next week on Pain-Capable Unborn Child Protection Act! The House of Representatives will vote on a bill next week that would ban nearly all late-term abortions...read more. "I am pleased to see this important legislation moving forward. In addition to protecting innocent babies who can feel the pain of an abortion, the new language goes further, adding protections for mothers and infants as well. I am thankful for all those who wouldn't let this issue fade. It is extremely important that we continue to defend the value of every child - born or unborn, and I look forward this bill coming to the floor." The fact of adoption weighs on some adoptees, adopted as babies with little or no access even in later life to the real story. I was one of those...read more. Researcher at Oxford University, argues that we are morally obligated to use new DNA editing techniques like CRISPR, which can precisely edit the human genome, to cure genetic disease...read more. Though short, A Merciful End comprehensively traces the twists and turns primarily of the Euthanasia Society of America...read more. May 9 -- Jefferson City -- Pregnancy Help Center of Central Missouri 5K Walk/Run. Memorial Park. Registration begins at 8:30 am and race at 9:00 am. For more information and to register online, please go to www.friendsofphc.org or call 573-644-6635. May 15 -- Belton, MO -- Missouri Right to Life Ed Fund Golf Tournament, 11:00 am, at Eagles' Landing Golf Course. Click here for more info.